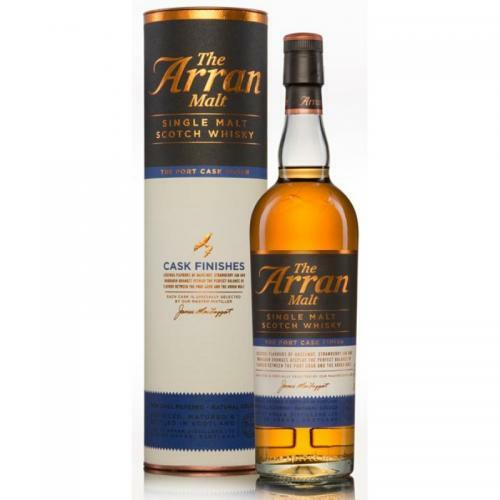 After initially maturing in traditional oak casks over a number of years, the Arran Single Malt in this bottling was finished in a selection of Port wine casks. The end result is a Single Malt full of charm, complexity and quality. Unique bottling from the only Distillery on the Isle of Arran. Casks sourced directly from an artisan wine producer. Aroma: Vanilla spice and ripe citrus runs straight into dried fruits and nuts. With just a splach of water, more depth of mandarin citrus is noticed with fudge and honeyed notes. Palate: Layered fruits and spice combine, with cinnamon baked apple with raisin and plum pudding then making a noticeable appearance. Finish: A pleasant kick that dances on the palate. Overall, the trademark barley-sweetness shines through the layers of complexity.